Part of helping your parent make moving to his or her new senior living facility a more positive experience is adding those little extras that turn a house into a home. The transition from the home that your mother always knew to a senior living apartment is a big change in her life, so it is important that she feels as safe and comfortable as possible. As the loved one of a senior, you know that mobility can be a significant challenge for your mother. Add on the fact that this is a new environment, and you have a situation that could result in an accident like a fall. If you are looking for new furniture, opt for designs that are round or don’t have sharp edges. It’s also a good idea to clear pathways of cords or rugs so that your mother’s chance of tripping is minimized. One of the best ways to make a smooth transition is to decorate with items from home. This can include cherished antiques that have been passed down, her favorite curtains, a comforting quilt or an old chair that she enjoys reading in. These things may be simple, but they can make her feel much more at home. It’s likely that your mother will want to bring extra pictures or keepsakes with her so that she can preserve her memories. However, these items tend to take up space. You can still find creative ways to store these goods with trunks or ottomans, which add a decorative flair to the new space without taking up too much square footage. Meeting new people is one of the first things your mother will do in a senior living space, so you will want to make sure that she has the best environment for being a good hostess. Have a few extra chairs and a comfortable sofa, if there is room, so that she can entertain her new friends with ease. Since eyesight tends to fade as we age, it’s important that your mother can see where she is going. While decorating, try to include bright colors that will make visibility easier for your mom. Not only do vivid hues like yellow, green and blue brighten up a space on an aesthetic level, they are easier for your mother to see. It’s also a good idea to make sure that spaces like hallways, the kitchen area and the bathroom are well-lit, and make sure that light switches are easy to find. Above all, be sure to make the experience easier for your mom by getting excited about her new home. 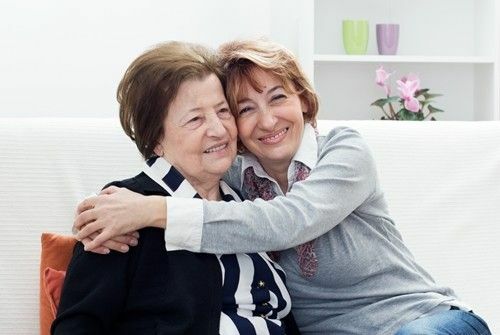 Having a positive attitude – and a little fun – during the transition will help your mother enjoy this change and add her uniqueness to the new environment. Visit the Aegis Living community near you to see how our residents have made themselves at home.